“It is the ‘re-accommodation’ heard ’round the world,” said Derek Thompson in TheAtlantic.com. 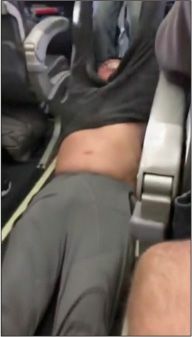 United Airlines created its own public relations nightmare this week after a viral video showed a 69-year-old passenger being violently yanked from an overbooked flight. Passengers had boarded Flight 3411 from Chicago to Louisville when they were told four seats needed to be vacated for United crew members. The airline offered $800 and a hotel stay to people who would switch flights; when there were no takers, a computer selected four “volunteers” to be bumped. One, Dr. David Dao of Kentucky, refused—saying he was a doctor and needed to see his patients the next morning. United summoned airport police, who wrenched a screaming Dao from his seat—smashing his face into the armrest—before dragging him, limp and bloodied, down the aisle. United CEO Oscar Munoz made matters even worse by releasing a cold, Orwellian statement in which he apologized for having had to “re-accommodate” Dao.